No one has been particularly pleased about how the iPhone 5 is going to need adapters for old peripherals, or about how those adapters are so damned expensive. If it's got you pissed, have no fear; the knock-offs have arrived. 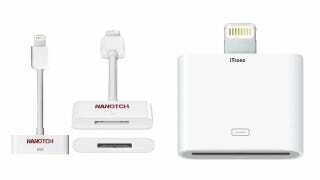 On Amazon, Nanotch is offering a 7-inch cable adapter for $18, compared to Apple's $39, and iTronz is offering the stub for $10 to Apple's $29. Both companies have generally positive ratings—94 and 96 percent positive reviews, respectively—but the iPhone 5 isn't even out in the wild yet, so cool your jets. While these will probably work, you're going to need something with a Lighting port before you (or anyone else) can really test them.